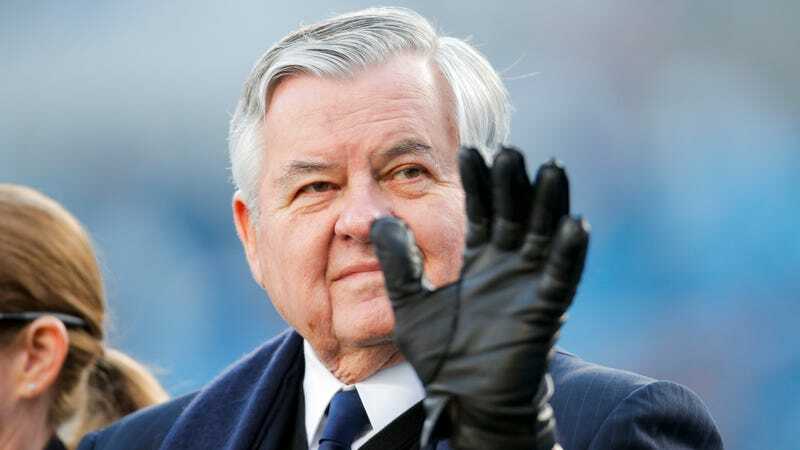 Just two days after the Panthers announced he was under investigation for workplace misconduct, and on the same day of a Sports Illustrated report that described a pattern of sexual harassment and casual racism, Panthers owner Jerry Richardson announced that he will look to sell his team this offseason. Richardson, age 81, is the only principal owner the Panthers have ever had since their creation in 1993. In his announcement, Richardson makes no mention of the investigation, or anything in the SI report, only saying “I believe that it is time to turn the franchise over to new ownership,” after listing some of the team’s historical accomplishments. “While I will no longer be the team owner, I will always be the Panthers Number One Fan,” Richardson writes. Along with the Panthers, he’s also a reported fan of asses in jeans, foot massages, and being allowed to shave women’s legs.